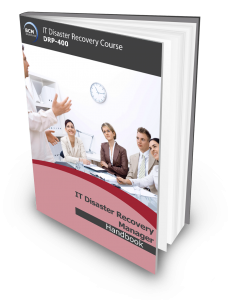 This course is intended for experienced IT disaster recovery (DR) planners. It is also designed for IT professionals who has minimal DR experience and would like to have an in-depth understanding of this subject. The main difference is that IT professionals with does not have the required years of IT DR planning experience will need to accumulate the necessary experience before they are awarded with the “Expert” certification. All aspects of IT DR planning will be discussed. Participants will be guided to review each stage of the DR Planning (DRP) Methodology and the process will include all aspects of creating the DR plan. The course concludes with the understanding on the need for exercising and maintaining the DR plan. DR Certified Expert (DRCE) Certification is awarded to participants who successfully completed and passed the Qualifying DRCE examination attached to the course, sends in an application detailing at least 3 year of DR experience , make the application processing fee payment of SGD150 and satisfies and meets the experience requirements of the independent certification body. Identify the threats that affect the IT and business environment and its countermeasures. Have a thorough understanding of the DR Planning Methodology. Conduct an application impact analysis for an organization. Develop and implement business and IT recovery strategies. Conduct cost benefit analysis for strategies and alternate site selection. Consolidate and implement a comprehensive IT DR plan. Create and develop IT DR awareness and training program. Integrate business continuity with the IT DR initiatives. Sustain an effective organisation-wide IT DR program. Experienced professionals with 3 years or more experience, from the security, risk management, facility, IT security, business operations who have direct or indirect responsibilities are encouraged to attend and apply for their Disaster Recovery Certified Expert (DRCE) certification. The pre-requisite is DRP-300 IT Disaster Recovery Implementer or DR Certified Specialist (DRCS). This course incorporates a 150-Multiple Choice Question electronic exam the next day. The duration of the examination is 3 and 1/2 hour. Candidates who achieve with a passing score of 75% or higher are eligible to apply for the BCM Institute’s Disaster Recovery Certified Expert (DRCE) accreditation. The examination fee is included as part of the course fee. This course fee does not include application processing fee for the DRCE certification. SGD150 Certification Fees are to be paid during application after participants have passed their Qualifying DRCE exam. The course fee includes the DRCE examination fee.